Everything That You Need To Know - Should You Buy the Apple iPad 2018? Everything That You Need To Know – Should You Buy the Apple iPad 2018? What's New About the Apple iPad 2018? ​/best-tablets-for-kids/​​​With every major tech brand making tablets of their own, why should you choose the Apple iPad 2018? To answer that question, you need to look at all the new features this tablet has to offer as well as the hardware. Of course, the price is an important thing consider too. You will also check out what the competition has to offer. After learning a little more about the tablet options available today, deciding if the Apple iPad 2018 is the right choice for you will be a piece of cake. Released in March of 2018, the Apple iPad 2018 is the latest model of the base iPads. The other two series being the iPad Pros and Minis. This iPad is made to be the standard choice of iPad. The pros include more power and new features, but that also means it costs more. The minis are more portable, but you sacrifice screen size and power as a result. So what makes the Apple iPad 2018 different from last year’s edition? First off, it has a new A10 Fusion processor, which according to The Verge, is “designed to be 40 percent faster than the A9 chip.” This means you’ll be able to use graphics-intensive iOS apps and games easily. The other big difference is the added compatibility with the Apple Pencil. The Apple Pencil is a pressure sensitive stylus with a fine tip. This allows you to draw on the iPad with precision, rather than making sloppy finger paintings. Overall there’s not a massive difference between the Apple iPad 2018 and the previous year’s edition. However, it’s enough to bring the standard iPad up a notch, keeping it competitive against the tablets of other brands. What makes the Apple iPad 2018 a strong tablet is its ease of use and high-quality hardware. From the IOS 11 operating system to the stunning retina display, the Apple iPad 2018 is designed around premium quality and ease of use. First, let’s talk about the features built into this device. Previously only compatible with the iPad Pros, the Apple iPad 2018 adds this compatibility to the standard iPads. The Apple pencil is a precise stylus that allows you to write on the iPad as if you’re writing with… Well, a pencil. The pressure sensitivity allows you to make lighter or thicker strokes depending on how hard you press the stylus down. This is a tremendous improvement and makes the Apple iPad 2018 a viable canvas to create art on. Because of its small size, and price of $99, you will have to be careful with it. It’s small size, and round body makes it easy to drop and break if you’re not cautious. The retina display on the Apple iPad 2018 presents a sharp, clear, and crisp resolution. Pictures and videos look fantastic on its display. The built-in software for the Apple iPad 2018 is IOS 11, Apple's latest software for their mobile devices. It’s incredibly intuitive and accessible. It lacks the customizability that comes with complexity, and for many, that’s a plus. Its operating system is intuitive and very easy to use. It doesn't have any jarring menus or settings that are difficult to trudge through. The operating system is very fluid and great for those who just want a simple design that does what they want it to. Use your iPad to video call anyone with a FaceTime-capable device, which is just about any recent iPad or iPhone. If you opt for the Wi-Fi + LTE edition, you can connect to the internet on the go using LTE data. Multitasking is a nifty feature of the Apple iPad 2018 that allows you to have multiple apps up at once. You’re able to send a text at the same time you’re watching a YouTube video. The Apple iPad 2018 boasts augmented reality capabilities. By using your camera, the iPad 2018 can make animated objects look like they are right in front of you. It’s a magical little feature that kids are sure to love. The well known virtual assistant, Siri, comes with the Apple iPad 2018. With Siri, you can find the weather, local businesses, and open apps hands-free. She’s nothing incredible, but a nice feature to have the option of using nonetheless. TouchID lets you use your fingerprint instead of your password to unlock your iPad. You can even use it with various apps, or to make payments. It’s a nice feature that saves you the hassle of always having to type in passwords. The Apple iPad 2018 comes with the first generation of TouchID, which is a little slower than the second generation found in iPad Pros. It still works and gets the job done though. If the stock storage isn’t enough for you, you can use iCloud to save photos, music, and more on the cloud. This expands your available storage, however, after 5GB you do have to pay for it. IOS 11 comes with an ample amount of features that make the Apple iPad 2018 easier to use for people who have disabilities. It has magnification, dictation, speech to text, and more. There is a robust array of features for the cameras in the Apple iPad 2018. You have live photos which make photos that act like a gif. Burst mode which lets you take a series of photos super quickly. Image stabilization which keeps the camera still even when your hands are jittering. Honestly, you could make an entire article on the Apple iPad 2018’s cameras and their features. Now let’s move onto the hardware of the Apple iPad 2018. This iPad is built to be affordable, while still performing as a great tablet. Therefore, you won’t be seeing the absolute top of the line specs, but it does boast great specs for its affordability. The Apple iPad 2018 has dimensions of 9.4 inches, by 6.6 inches, by 0.29 inches, and weighs 1.03 lbs. It’s a nice size if you want something portable, but big enough to enjoy using at home. The iPad comes with a 9.7 inch, 2048x1536, 264ppi, LED-backlit retina display screen. It’s a very high resolution and presents a vivid and crisp picture. It comes with a fingertip resistant oleophobic coating to prevent an excess of smudges on the screen as well. The rear facing camera is a quality eight-megapixel camera. It’s nothing breathtaking, but it does take good, clear photos to enjoy. It also records in 1080p up to 120fps, which is nothing to be scoffed at. The front facing camera is a bit more dismal. It takes 1.2-megapixel photos and records in 720p. It’s nothing fancy, but you’re still able to use it for apps such as FaceTime and Snapchat. A 32.4w lithium-polymer battery is built into the Apple iPad 2018, providing 10 hours battery life when surfing the web. The Apple iPad 2018 has Bluetooth 4.2 technology built in, allowing you to connect to Bluetooth speakers, keyboards, the Apple Pen, and more. You get Wi-Fi speeds up to 866 Mbps, and LTE speeds up to 300 Mbps with the 2018 iPad. The built-in Apple A10 processor, with 2GB of RAM, provides a lot of power for your iPad. If you use your iPad for intensive tasks such as photo editing, this will allow you to complete those tasks with ease. The A10 processor is also great if you enjoy playing IOS games with demanding graphics. You can choose between the 32GB or 128GB models of the 2018 iPad. If you just use your iPad for streaming, web surfing, and other light tasks, the 32GB model is the choice for you. If you want to store a lot of photos, videos, and games on your iPad, the 128GB is your choice. Starting at $329 for the 32GB Wi-Fi only model on Apple’s website, the Apple iPad 2018 is a solid deal. You get a lot of impressive features and hardware for a reasonable price. If you want more features, a faster processor, or a bigger screen, you can always opt for the iPad Pro. If you’re looking for an affordable tablet that gets the job done though, this should definitely be one of your top choices. The top brands that compete with the Apple iPad 2018 are the Samsung Galaxy Tab S3, the Amazon Fire HD 10, and the ASUS Transformer Mini T102HA. The Samsung Galaxy Tab S3 is one of the closest tablets you’ll find to the iPad 2018. The Amazon Fire HD 10 is a strong competitor due to its low price. 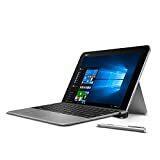 Last on the list; the ASUS Transformer Mini provides a unique laptop/tablet combo that gives you something different than the average tablet. 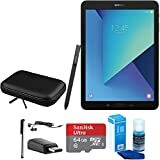 The Samsung Galaxy Tab S3 has superior cameras to the Apple iPad 2018, with 13-megapixel photos and 4K video. It has 4GB of RAM which gives it a slight edge in multitasking power. The Samsung Galaxy Tab S3 also comes with an S Pen, which is similar to the Apple Pen. All in all, it’s pretty similar to the iPad 2018 with a few variances in power and design. 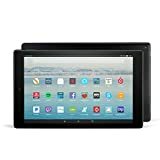 The Amazon Fire HD 10 has less power, lower resolution cameras, and a lower screen resolution than the Apple iPad 2018. With that being said, it’s far more affordable. If you’re looking for something that will get the job done for a low price, then this is the choice for you. Coming with Windows 10, the ASUS Transformer Mini T102HA is a cross between a laptop and a tablet. It has a detachable keyboard, a 170 kickstand, and an ASUS Pen for sketching. It comes with ports for microSD, micro USB, micro HDMI, and a full-sized USB 3.0 port. It’s a great pick for someone looking for a tablet that acts more like a laptop. The Apple iPad 2018 is just as capable as any other mid-range tablet on the market. The iPad Pro has more processing power and a more vivid display, but the 2018 iPad has enough power and clarity that it’s not an issue. The biggest downside is that the Apple iPad 2018 runs average with most specs, but that’s also the selling point of the device. If you’re looking for a mid-range tablet, this is the choice for you. It’s not even close to the bottom of the bin, and it’s not nearly as expensive as the high-tier tablets. The Apple iPad 2018 is a tablet that provides you with a strong lineup of features and hardware, without forcing you to break the bank. Because of the premium quality, you receive for its price, the Apple iPad 2018 gets 4.3/5 stars. Apple iPad 2018 is the latest model of the base iPads. The other two series being the iPad Pros and Minis. This iPad is made to be the standard choice of iPad. The pros include more power and new features, but that also means it costs more. The minis are more portable, but you sacrifice screen size and power as a result. Next articleCheap Tablets For Kids: Is It Worth Buying Those Cheap Techs?